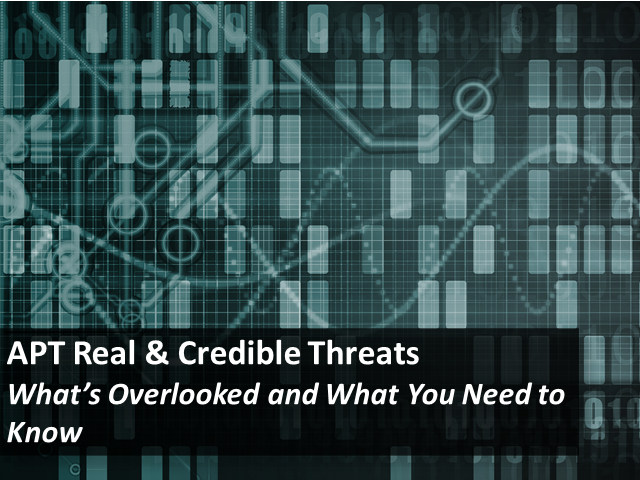 APT: Real and Credible Threats – What’s Overlooked and What You Need to Know? Advanced Persistent Threats -- are they hot, hype or both? What’s really new and what’s really old? What risks are of most concern? How broad is the range of risks? What really are the root causes of risks? What really is a “dynamic threat environment?” What is the difference between responding to these risks versus others? How can you more effectively watch for warning signs of trouble? How can you best prioritize your risk responses to strengthen capabilities in general and prepare for the “bad thing?”? How can responses be most efficiently designed? More, how can you do this most easily? With a mountain of good guidance available, to what do you turn and how do the documents interrelate? This roundtable brings you into a unique interactive discussion with top experts from the 2013 ISACA Los Angeles Conference – Cyber Security: Real and Credible Threats. Join them to help you separate fact from fiction and develop an action plan that packs the most business benefit. Bring your toughest questions to put them to the test and speed progress. Title: APT: Real and Credible Threats – What’s Overlooked and What You Need to Know?